← Show your support for New Zealand Babywearing Week – Share our Logo and WIN! Guess and Win with Pikau the New Zealand Babywearing Week Kiwi!! 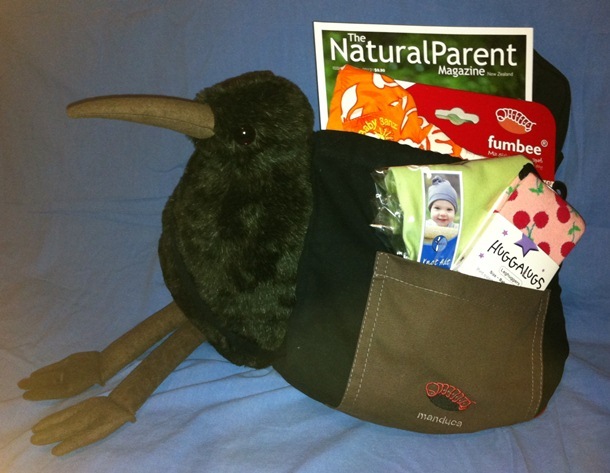 Pikau the New Zealand Babywearing Week Kiwi is sooooo excited to hit the road and join as many of you as he can at some of the events happening around New Zealand from October 6th – 14th for New Zealand and International Babywearing Week! Look! He has his bag packed all ready with some of the giveaways that will be up for grabs at official events, thanks to some very generous sponsors! Pikau is looking forward to assisting with the prize draws at as many events as he can manage to get around. Pikau has a special prize up for grabs to two lucky Kiwis. All you need to do to be in the draw to win, is guess four of the events that Pikau will be making an appearance at this year. Hint: Check out the official events listed on our site to help you make your guesses. Email your guesses to info @ mynaturalbaby dot co dot nz along with your name, address and phone number. The cut off for entries is 8am on Saturday 6th October 2012. The two winners will be announced as soon as possible after the 14th of October. Pikau’s prize for you is pictured below and includes a set of fumbee shoulder strap protectors (suitable for any baby carrier, stroller/pushchair or car seat straps) from My Natural Baby, a pair of Huggalugs leg and arm huggers from our friends at Huggalugs and a copy of the latest The Natural Parent Magazine. Big thanks to our prize sponsors!! Prize value is $60.00! (Prize can only be shipped within New Zealand). Good luck and happy guessing! Where is Pikau going during New Zealand Babywearing Week? 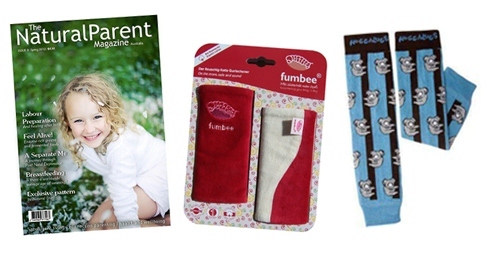 This entry was posted in Giveaways and tagged fumbee shoulder strap protectors, Huggalugs, New Zealand Babywearing Week, NZ Babywearing Week, Pikau, The Natural Parent Magazine. Bookmark the permalink.